IMAGE: The massive subduction zone earthquake that hit Nepal in 2015 also caused thousands of landslides. CORVALLIS, Ore. – Research teams have evaluated the major 7.8 magnitude subduction zone earthquake in Gorkha, Nepal, in April 2015, and identified characteristics that may be of special relevance to the future of the Pacific Northwest. Most striking was the enormous number and severity of landslides. Many people understand the damage that can be caused to structures, roads, bridges and utilities by ground shaking in these long-lasting types of earthquakes, such as the one that's anticipated on the Cascadia Subduction Zone between northern California and British Columbia. But following the Nepal earthquake – even during the dry season when soils were the most stable – there were also tens of thousands of landslides in the region, according to reconnaissance team estimates. In their recent report published in Seismological Research Letters, experts said that these landslides caused pervasive damage as they buried towns and people, blocked rivers and closed roads. Other estimates, based on the broader relationship between landslides and earthquake magnitude, suggest the Nepal earthquake might have caused between 25,000 and 60,000 landslides. The subduction zone earthquake expected in the future of the Pacific Northwest is expected to be larger than the event in Nepal. Ben Mason, a geotechnical engineer and assistant professor in the College of Engineering at Oregon State University, was a member of the Geotechnical Extreme Event Reconnaissance team that explored the Nepal terrain. He said that event made clear that structural damage is only one of the serious threats raised by subduction zone earthquakes. "In the Coast Range and other hilly areas of Oregon and Washington, we should expect a huge number of landslides associated with the earthquake we face," Mason said. "And in this region our soils are wet almost all year long, sometimes more than others. Each situation is different, but soils that are heavily saturated can have their strength cut in half." Wet soils will also increase the risk of soil liquefaction, Mason said, which could be pervasive in the Willamette Valley and many areas of Puget Sound, Seattle, Tacoma, and Portland, especially along the Columbia River. Scientists have discovered that the last subduction zone earthquake to hit the Pacific Northwest was in January 1700, when – like now – soils probably would have been soggy from winter rains and most vulnerable to landslides. The scientific study of slope stability is still a work in progress, Mason said, and often easier to explain after a landslide event has occurred than before it happens. But continued research on earthquake events such as those in Nepal may help improve the ability to identify areas most vulnerable to landslides, he said. Models can be improved and projections made more accurate. "If you look just at the terrain in some parts of Nepal and remove the buildings and people, you could think you were looking at the Willamette Valley," Mason said. "There's a lot we can learn there." In Nepal, the damage was devastating. Landslides triggered by ground shaking were the dominant geotechnical effect of the April earthquake, the researchers wrote in their report, as slopes weakened and finally gave way. Landslides caused by the main shock or aftershocks blocked roads, dammed rivers, damaged or destroyed villages, and caused hundreds of fatalities. 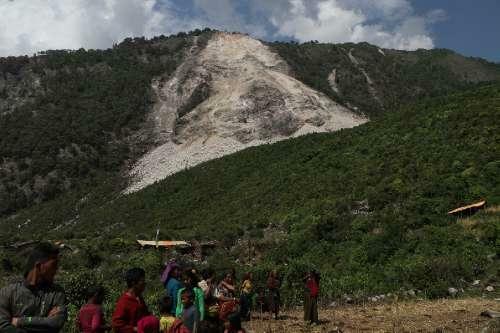 The largest and most destructive event, the Langtang debris avalanche, began as a snow and ice avalanche and gathered debris that became an airborne landslide surging off a 500-meter-tall cliff. An air blast from the event flattened the forest in the valley below, moved 2 million cubic meters of material and killed about 200 people. Surveying the damages after the event, Mason said one of his most compelling impressions was the way people helped each other. "Nepal is one of the poorest places, in terms of gross domestic product, that I've ever visited," he said. "People are used to adversity, but they are culturally rich. After this event it was amazing how their communities bounced back, people helped treat each other's injuries and saved lives. As we make our disaster plans in the Pacific Northwest, there are things we could learn from them, both about the needs for individual initiative and community response." Aside from landslides, many lives were lost in collapsing structures in Nepal, often in homes constructed of rock, brick or concrete, and frequently built without adequate enforcement of building codes, the report suggested. Overall, thousands of structures were destroyed. There are estimates that about 9,000 people died, and more than 23,000 were injured. The earthquake even triggered an avalanche on Mount Everest that killed at least 19 people. The reconnaissance effort in Nepal was made possible by support from the National Science Foundation, the U.S. Geological Survey, the U.S. Agency for International Development, the OSU College of Engineering, and other agencies and universities around the world.